Hippie clothing refers to clothing worn or made by “hippies," or clothing made to evoke or imitate these styles. 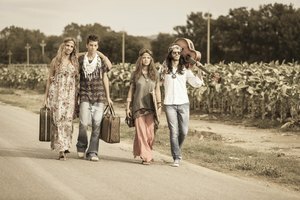 Hippies are best described as people belonging to a international subculture movement in 1960s and 1970s that, in addition to fashion, also had its own characteristic music, philosophy and way of life. 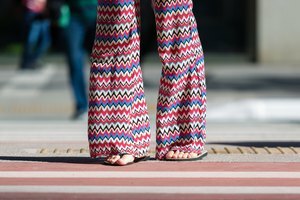 Garments frequently associated with hippie clothing include bell-bottom pants, long skirts, vests, large blouses, and accessories such as beads, scarves and headbands. Other themes in hippie clothing include psychedelic patterns and vibrant colors. Often these patterns mimic flowers, landscapes, or other nature imagery. Symbols and icons, especially from Eastern cultures, are also featured prominently. 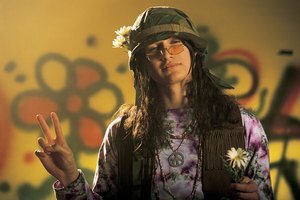 Historically, garments and themes associated with hippie clothing were associated with other trends in personal appearance. For example, men often wore beards and long hair and women often went bra-less or did not shave their body hair. Much of the fashion associated with hippie clothing borrowed inspiration from traditional Native American, South American, African, Asian and Indian clothing. Aspects of hippie culture and philosophy are present in the design and materials of hippie clothing. For example, many hippies made their own clothing in order to reject the status quo, and strongly preferred natural materials such as cotton, wool or hemp.